The translation company Baltikumspecialisten Sangun Veinberg, which later changed its name to Baltic Media, was established in Stockholm in the early 1990s by Guntar and Sandra Veinberg, linguists with a Ph.D. degree in linguistics and communication. The company served Nordic and Baltic government institutions and companies in their communication, translation, interpretation and localization needs into and from languages around the Baltic Sea after the fall and communist regime in Europe. The first working tool at Baltic Media was the computer Macintosh SE, invented by Steve Jobs and produced by company Apple, that started a new era in the communication technologies. 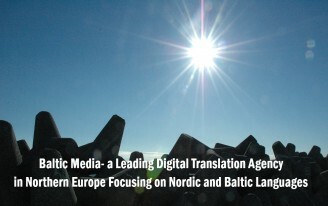 Translation company Baltic Media Ltd is a leading provider of translation and localization services in Northern Europe, offering businesses a full range of professional translation services in over 150 languages since 1991. Our services cover over 150 languages for the translation of your documents to enter global markets with high quality localized products and services that meet the language and functionality requirements of customers in any locale. We help Northern European companies to reach global markets. We help international and global companies to reach European markets around the Baltic Sea and in Northern Europe. If you wish, you are welcome to use e-mail adress [email protected] to send your price request or other inquiry.